It's that time of year again! Time to purchase beautiful poinsettias as a District Fundraiser! 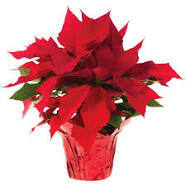 Poinsettias are only $8.50 each. Grown right in the Great State of Ohio. Red or White in 6 1/2 inch pots. These make great gifts for anyone. They also make a GREAT CLUB SERVICE PROJECT for Senior Citizens or people at assisted living facilities! Please mail club order forms and checks made payable to District OH7 Lions (poinsettias in memo line) and mail to Lion Fran Heimerl, 117 North 5th St., Newark, OH 43055. Click here for instructions and ORDER FORM.